When the doctors told me the protocol for Her2 + positive was chemotherapy I was upset, mad and confused. I immediately called for a 2nd opinion. Not surprisingly, Dr. Cheng was very supportive of me getting a 2nd opinion. She was very comforting and encouraged me to seek out all my options. That’s why I ultimately stuck with her. I faxed my records to an oncologist in NYC affiliated with Slone Kettering. They responded very quickly with an offer of an appointment but then my surgeon suggested I meet with Dr. Richard Zelkowitz instead at Norwalk Hospital and Whittingham Cancer Center located in Norwalk, CT. By now, I trusted Dr. Cheng so I called that Friday to set up an appointment. Dr. Z called me back and asked could I come to meet him ASAP so I called my husband, Alan to come home and pick me up. It was a very somber 45-minute drive to the hospital. Dr. Zelkowitz met with us for 3 hours describing what comes next. He also asked to take medical records with him to a HER2 conference in Dallas, TX to have them reviewed by other experts. I agreed. Who wouldn’t want to have their records reviewed by all the top oncologist all over the country? Dr. Z took us on a tour of the infusion center, which can be very intimidating. There are 20 suites all the seats that were filled with men and women. Dr. Z explained that they were all getting infusions and most were there for chemotherapy. Believe me, you don’t know if you should cry or run. I walked in with Alan behind me and Dr. Z introducing me to patients with there IV’s hooked up to them. After that overwhelming 3 hours, we jumped into the car and I said I’m glad that’s not going to be me. By Sunday afternoon I got a call from Dr. Z saying his collages all agreed on I should do the protocol for Her2 positive Taxol, Radiation, and Herceptin. This meant Chemo! I set up an appointment to meet with the nursing navigator, Mary, at Norwalk Hospital. I had made the discussion to do chemo treatments at Norwalk Hospital in Norwalk CT since my experience there was so tremendous. Everything started moving very quickly! First I met with Mary who handles scheduling the patient chemotherapy calendar, medications and managing side effects. When she explained what Taxol does to your body, I was sick! I was shocked when they asked me to consent to the possible side effects, which included death. I was fighting back the tears. I sat there for 5 or so minutes not knowing what to do. Mary explained that my chance of surviving is better with than without the treatment. “You’re young. You do want to be around another ten years?” she said. I didn’t understand. The doctor removed my tumor…I’m was cancer free! So, what’s the big deal? I reluctantly signed and went home scared upset and plan and simply confused. When my husband got home he never asked me what happened so I asked do you want to see the sheet with all the side of effects from chemo? He said no and asked me to NEVER talk about it again. He was scared. I went to bed and cried my eye’s out. 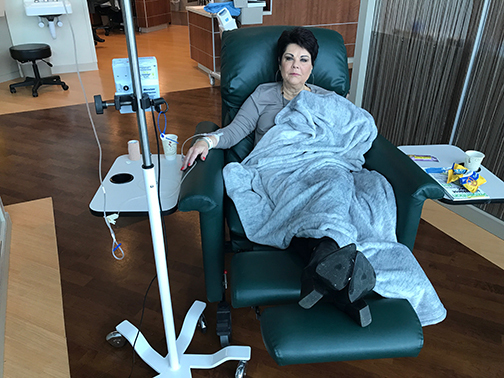 I was starting chemo in less than a week and I was terrified of the coming unknown.